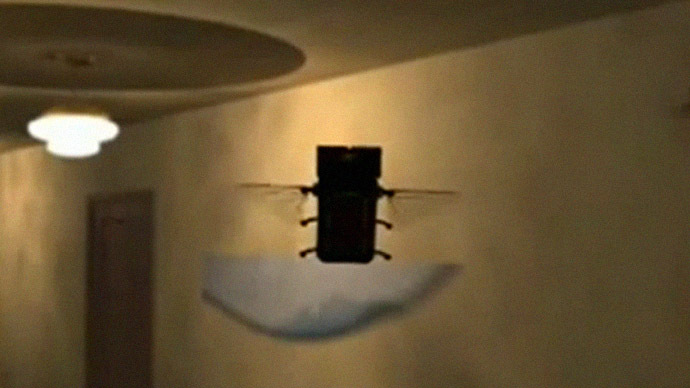 The US Air Force is developing bug-sized drones that will be able to fly, crawl, perch and hover while performing unprecedented surveillance tasks and carrying out deadly targeted missions. "Unobtrusive, pervasive, lethal – Micro Air Vehicles, enhancing the capabilities of the future war fighter," says the video. The tiny drones will be able to enter inaccessible locations using new forms of navigation such as a vision-based technique called “optic flow,” which can be used when traditional methods like GPS are unavailable. The project, which was originally revealed in the March issue of National Geographic, is based at Wright-Patterson Air Force Base in Dayton, Ohio. Tiny remote-control prototypes have already been developed. However, due to high power consumption they can only operate for a few minutes.